Warmer weather isn’t the only thing to get excited about this spring. Check out some of my favorite trends for the upcoming season. Denim Overload: When I think of the easy breezy months of summer and spring, denim comes to mind. Luckily, designers like Stella McCartney and Phoebe Philo agree with this stylish sentiment and created full denim confections similar in chicness to this Chloé romper. However, if you are like me and want to get a head start on the bevy of blue, try a denim jumper on for size. Don’t Be A Square: This season is full of statement accessories, but circular shapes and accessories adorned with rings reigned supreme. From the round alligator clutches and ring hair clips at Céline (chic, yet cheap version here) to a circle carryall by Marc Jacobs , the basic shape never looked so chic. 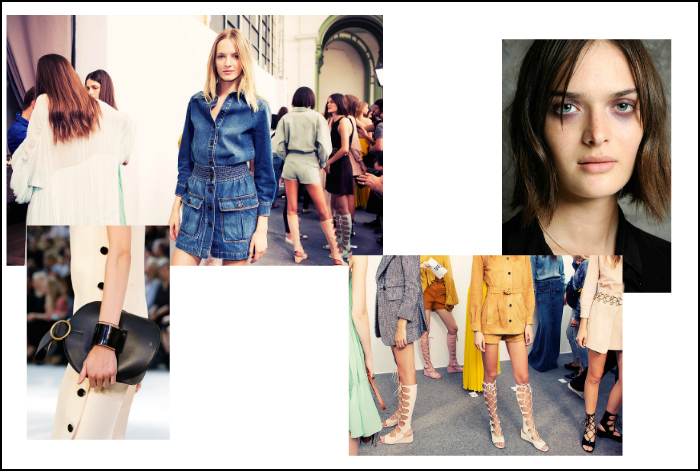 Gladiator Game: After taking a backseat the past few seasons to simple designs, the strappy gladiator sandal is back and battling it out for the coveted title of biggest shoe trend for spring 2015. Chloé supplied us with full suede confections featuring wedged heels, while Michael Kors had his models step into a new season with a much flatter take on the trend. Purple Reign: I may not don a lot of color. However, I do enjoy the occasional pop of it and Vera Wang’s eggplant eye shadow has me wanting to add the hue to my current beauty regimen. Many of the spring presentations featured different shades of the color as a fresh alternative to the smokey eye. The best part about this trend? There are so many variations of purple that you are almost guaranteed to find one that is perfect for you and your spring arsenal. I love that denim dress and those gladiator boots! I completely support the denim trend, always, every year in any season. Denim is so hot right now and I can’t get enough either! The circle-shaped Marc Jacobs is one of my fave pieces from the spring runways! If only spring meant warmer weather here in London !! But I really can’t wait to change up my wardrobe from the thick winter knits I have gotten so use to. Lovely blog post, would be lovely if you could check out my blog. Summer is already here, so in our hurry to find the perfect dresses for the special occasions that summer will bring up, we should take a look – as I did – on the online boutique Talis, l’Atelier Creatif!